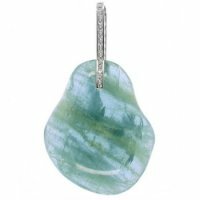 A seductive cabochon aquamarine pendant composed of a large, free formed Aquamarine masterfully set suspended from a diamond set loop. The loop is set with 12 small diamonds weighing 0.10cts in total. All mounted in 18ct White Gold. 43 x 35 mm. 18k - 750.